If you are like me, garlic is a staple in your kitchen. I actually think Yankee Candle needs to come out with a garlic scent, I would so be buying that baby! And because I have this love affair with garlic I want to make sure I have it year round. 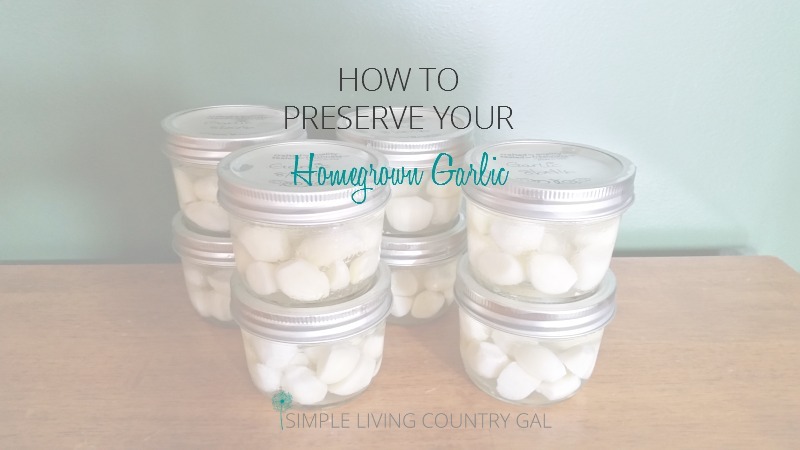 Two years ago I stumbled across a recipe for preserving garlic in distilled vinegar that you then store in your refrigerator. I gave it a try and it is amazing! The garlic tastes just as good in January as it does in September. I now do my garlic this way every year. 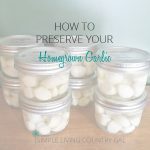 How to preserve garlic so it lasts all year. 1. Choose your best heads or garlic to preserve. I usually make a pile of less than optimal garlic to use up right away, a pile of garlic to plant the following year, and a pile I want to preserve. By selecting only my best cloves ensures it will can and keep the full year. 2. Peel the cloves. Each and every one. The hardest part of this recipe is actually peeling the cloves. I know you can do the mason jar technique, but I find it bruises the garlic and I don’t want to preserve bruised cloves. So, I sit myself down in the family room with a good movie and peel away. If at all possible get yourself a pair of gloves. If you are peeling quite a few heads of garlic your fingers will start to burn. Wearing gloves helps to protect them. Once your cloves are all peeled, give them a quick rinse and set aside. 3. Heat up your vinegar. 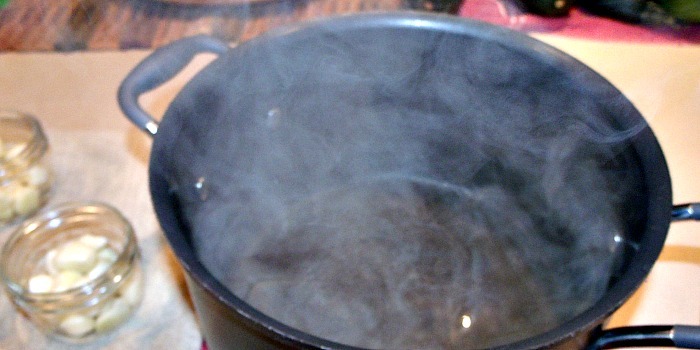 Add your vinegar to a large pot and bring to a boil. I use white distilled vinegar. A little over a gallon jug of vinegar will do about 12 40z jars of garlic. 4. Fill your jars with cleaned cloves. While your vinegar is coming to a boil, put your cloves into the clean jars. The jars do not have to be stuffed full. I put enough in that I feel I can use them up in a reasonable amount of time once I open the jar. 5. Add hot vinegar to your jars. Ladle the vinegar over the garlic, leave about 1/2″ of head-space. Wipe clean the rims of your jars with a cloth. Use a new lid and ring and turn fingertip tight. Even though you are not doing a water bath, the heat from the vinegar will give you a seal. So make sure you are not reusing lids. 6. Let the jars cool overnight on the counter. Label each jar with the date. You can now store your garlic in the refrigerator for up to one year. I have used garlic a few weeks past the year mark with no issues, longer than that I do not advise. Ninja tip! 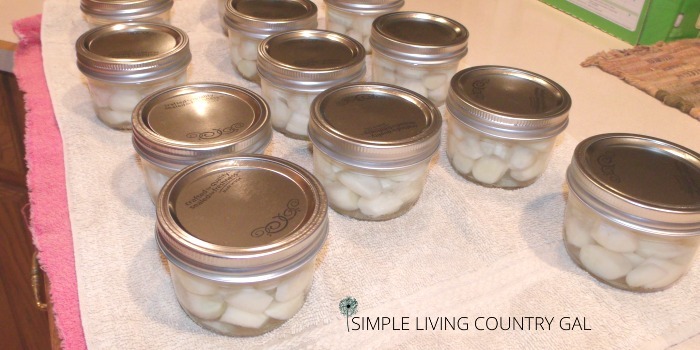 Once you begin using your jars of garlic, the metal lids can get a bit difficult to open. They also tend to rust quite easily. You can find these plastic lids just about anywhere. Once I open my jar I will replace it with a plastic lid. No more hard to open jars or rust. Another plus is you can write the date on the lid that you opened the jar. Works perfectly! 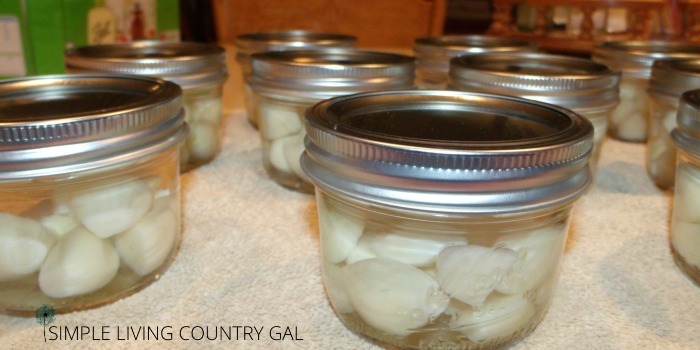 A simple and delicious way to enjoy garlic from your garden year round! 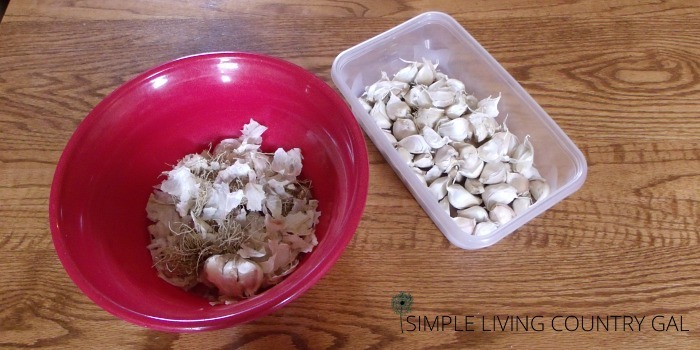 Separate your cloves from the head of garlic. Peel and clean. In a pot bring distilled vinegar to a boil. While waiting for the vinegar to boil, add your cloves to your jelly jars. Ladle hot vinegar over cloves. Clean rims of jars with a clean towel. Top with clean lids and rims. Let cool over night on a towel. Label lids with date and store in your refrigerator for up to one year. Yes, you can, I believe it’s a water bath of 10 minutes but I would research more before doing it. The shelf life is still a year, so that is the main reason I do it the other way. Much quicker with the same results. Do the jars self seal? Can I put the jars in the cupboard and just put an opened one in the refrigerator? I don’t have that much room in the refrigerator. Although the jars do seal it is not a qualified airtight seal. That is why I keep mine in the refrigerator. Just in case. Unless you are a heavy garlic user, 10 – 4 oz. jars should be enough and do not take up that much room. I kept mine in my deli drawer all the way in the back. 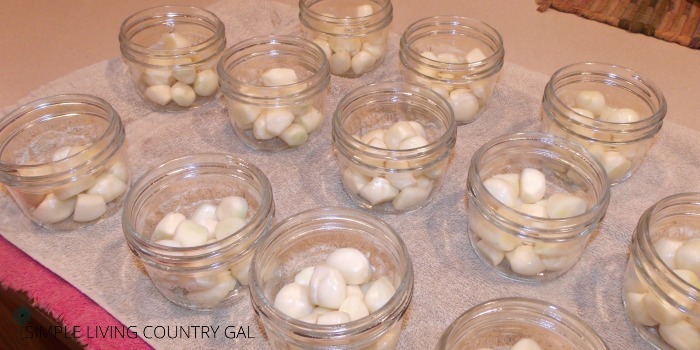 Do you dry out your garlic or just pull them from the ground and clean and can? Yes, I do Carol. I let them dry just like normal, then peel can.